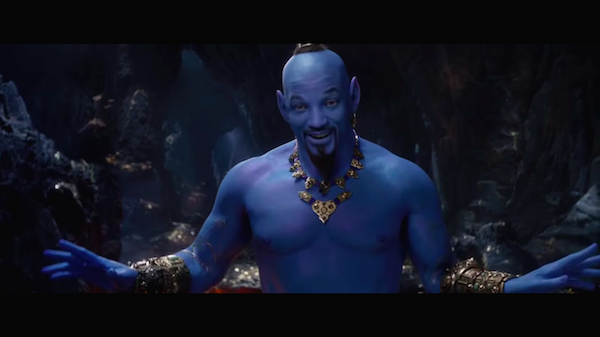 Disney has given fans their first full look at ‘Genie’, played by Will Smith, inside its upcoming live-action remake of its animated classic Aladdin. While the cast had starred on Entertainment Weekly magazine’s cover with a non-blue Smith as the character, this special look at the fictional personality—originally voiced by the late Robin Williams in the 1992 animation—has assured fans that he will indeed be very blue, not to mention, ripped. The film is directed by Guy Ritchie, with Mena Massoud playing the main character of charming street rat ‘Aladdin’. The rest of the cast includes Naomi Scott as ‘Jasmine’, Marwan Kenzari as hot ‘Jafar’, Navid Negahban as the ‘Sultan’, Nasim Pedrad as ‘Dalia’, Billy Magnussen as ‘Prince Anders’, and Numan Acar as ‘Hakim’. Disney’s live-action Aladdin comes to cinemas on 24 May 2019.